We will use a role called ‘PoolManager’ and thus let’s create a directory under ‘plugin/parts’ for our package. 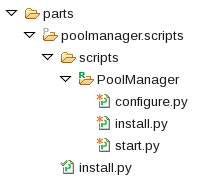 So, this directory will be called then ‘poolmanager.scripts’. Under this directory we will create the directory corresponding to the role ‘PoolManager’ and its different lifecycle files, this can be achieve by calling the ‘New’->’Plugin Role’ of the PDK plugin. This has to be done in the config.json, just add the following lines in the config.json file at the same level of the ‘patterntypes’ element (don’t forget the colon between the 2 elements). 2.3) Define the OSGI files for the topology provider. Using the PDK plugin, right-click ‘New’->’OSGI Service Component'; provide ‘POOLMANAGER’ as name and leave all other value as-is. A new entry will be added in the META-INF/MANIFEST.MF to register the OSGI service and a new poolmanager.vm will be created in the plugin/templates directory. 2.4) Update the topology template. This entry was posted in IBM PureApplication System, IBM SmartCloud Application Services and tagged #ibmcloud, #ibmpuresystems, #puresystems, #SCAS, #SCAWS by ITDoVe. Bookmark the permalink. I want to develop an external shared service for IWD 4.0. could you provide any pointers ? Varsha, The current version of IWD is 3.1.0.7 and information on shared service can be found in the infocenter.